Biophotonics is a branch of science dealing with the interaction of light in biological substances such as tissues and cells at scales ranging from microns to the nano-level. It plays a vital role in the development of healthcare services by lowering the costs of treatment, with a suitable methodology for treatment of people in the aging society. Biophotonics consists of optics, photonics, nanotechnology, and biotechnology. Clinical biophotonics are also termed as therapeutic biophotonics, because the whole process deals only with therapeutic measures to treat diseases and to alter the biological processes using high energized optical radiations. Instruments like laser scanning systems, optical coherence tomography, and laser polarimetry are used to acquire precise knowledge of retinal tissues and vessels. The photo-ablation effect of lasers is helpful in the process of laser osteotomy. This property of lasers can be used to perform operations that cause less damage to the internal and surrounding tissues and also provide good control on the depth of cut. Sensor controlled laser systems play a major role in the field of clinical treatments. They are involved in investigational tests of living tissues in animals and humans. Sensor combined laser sources are also used in treatment of malignant tissues in order to perform specific excision of the infected tissue in an efficient and safe way. This method is also used for removal of tumor tissues and intraluminal calculi. The use of laser has the benefit of radiation transportation. Incident radiation from a laser source can be transferred using thin flexible optical fibers into the body endoscopically via natural body openings and small surgical cuts. 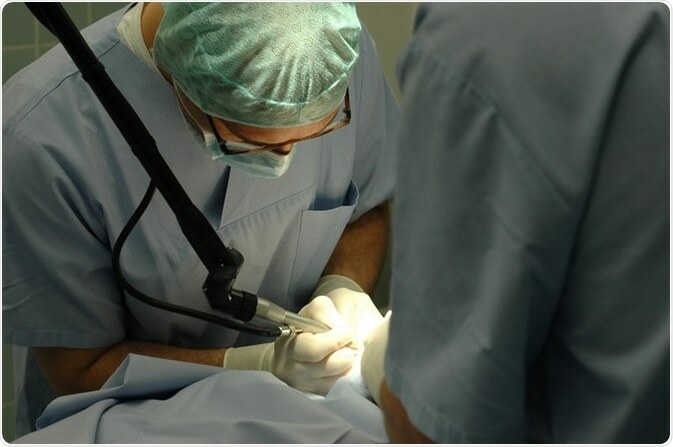 Hence, the process of conventional surgery that requires larger incisions is replaced by laser endoscopic surgery to reduce the patient’s surgical pain. The time required for potential surgical treatment is reduced to a level equal to the time spent on treatment of outpatients. Laser tissue processing methods such as incision, coagulation, and excision follow various laser–tissue interaction procedures. These are involved as clinical measures in various medical fields such as ophthalmology, gynecology, urology, dentistry, and surgery of ear, nose, and throat. Intense control over the laser systems enhance the performance of treatments with high precision and also help to avoid harmful effects to the nearby tissues. Nowadays, laser treatments are mainly opted for because the incision and excision process takes place at very high temperature and, therefore, the tiny blood vessels and slits in the nerve-endings get solidified and lead to reduced loss of blood and surgical trauma. Photodynamic therapy is one of the major applications of biophotonics. PDT consists of three components: photosensitizer (light sensitive chemical that can be energized by light of a specific wavelength), light source, and tissue oxygen. In this treatment, patients are given a photosensitizer chemical and then the excitation light is irradiated on them by the surgeon. Non-malignant diseases such as ophthalmic disease, cardiovascular disease, dermatological disease, and urological disease. Malignant diseases such as brain tumor, head and neck cancer, ophthalmic tumor, pulmonary and pleural mesothelial cancer, breast cancer, gastroenterological cancer, urological cancer, gynecological cancer, and skin pre-malignant and malignant diseases. Femtosecond laser (FSL) cataract surgery is a recent technique developed in the field of ophthalmology with improved stability and predictableness in corneal incisions and anterior capsulorhexis. It involves the use of excimer and femtosecond lasers for treatment of refractive errors. It allows successively less phacoemulsification energy and time required, which results in reduced corneal edema. FSL allows complexity of the anterior capsulotomy, intraocular lens (IOL) placement, capsule overlap, and centration of the IOL. Further advancement in these methods will enhance the treatment of myopia, hypermetropia, and astigmatism. Artificial vision in humans can be achieved by opto-mechanical stimulation that provides vision for patients with ocular blindness. In this process, optical chips are embedded in the sub-retinal space that permits supplementation of the ocular path. Future developments in this process include stimulation of the optical cortex with electrical signals from video systems that can replace the working of the eyes and provide artificial vision. This process involves clinical treatment using light with wavelength near or equal to the infrared light in the spectrum band. NIR radiation enables wound healing, supports muscle repair, and promotes angiogenesis. It is employed in various conditions such as skin ulcers, osteoarthritis, peripheral nerve injury, low back pain, myocardial infarction, and stem cell induction. Light emitting diodes (LED) can reduce pain and stimulate wound healing in patients who have undergone bone marrow transplantation. Research on clinical biophotonics is heavily focused on invention of more efficient drugs that enable far/near infrared wavelength activation, so that increased volumes can be treated under surface illumination.